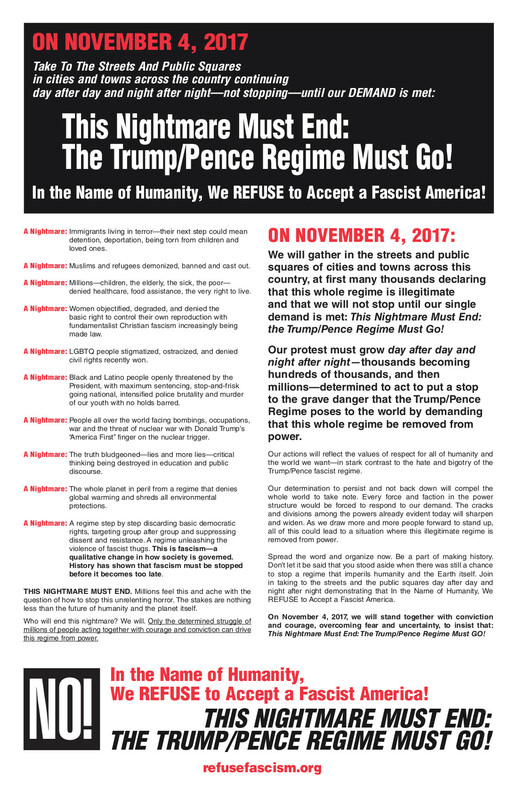 On August 19th, 450 people gathered in five regional conferences held around the country by Refuse Fascism to get organized to make November 4 the launch of a massive national mobilization that continues and grows day after day and night after night until their demands are met: This Nightmare Must End: The Trump/Pence Regime Must Go! Coming in the wake of Trump’s defense of white supremacists and Nazis after they carried out brutality and murder in Charlottesville and Trump’s recent bellicose threats to unleash “Fire and Fury” against North Korea, the gatherings had an air of seriousness and determination. For many in attendance, this kind of organizing was new but they felt strongly that protest-as-usual, while necessary, will no longer suffice. They were drawn to the slogan, “This Nightmare Must End: The Trump/Pence Regime Must Go!” and they were looking for a way to invest their time and energy that really stood a chance of stopping the Trump/Pence nightmare that grows uglier by the day. Video of Heather Heyer’s mother, Susan Bro, challenging everyone to live like Heather by stepping up against injustice was played to open the conference. Next, people listened intently and then wrestled together with speeches which laid out a vision of what November 4th and the days and weeks that follow must look like to succeed in creating the kind of political crisis in this country that forces every faction of those in power to respond to our demand that the Trump/Pence Regime Must Go! and why the fascist character of the regime makes this possible and makes anything less completely inadequate. In a second plenary and then in smaller planning break-out groups, plans were made to begin bringing forward many thousands to launch the November 4th movement – the need for medics and lawyers, the role of students and faith communities and leaders, the role of professional associations and community groups. Plans were also made for social media and fundraising, for both organizational and street level outreach, and for reaching out to and involving students and campuses – with particular attention put on really kicking out the jams to raise funds. At the East Coast regional conference a plan was made to do the kind of widespread and attention-grabbing promotion so that by soon after Labor Day, September 5, everywhere you go, people will know that on November 4th It begins and that there is a powerful Call and a plan that is circulating in the minds of millions throughout this country…..
Their November 4th kickoff date seems to have been selected because it was the day that Zero was first elected President in 2008. This provides you with one small clue as to whom is behind this effort. Their Chicago organizing session was held in the Trinity Episcopal Church at 125 East 26th Street and this will be the continuing headquarters for Antifa rioters across the Upper Midwest, including Michigan. Robert Creamer had his operatives there, and he is probably still lavishly funded by George Soros. So this is going to be a serious, long term, theatrical experience. Meeting in a church to oppose politicians is a blatant violation of the Johnson Amendment, but these folks do not appear to be much concerned by legal niceties. This gives you further reason to expect widespread violence and unpleasantness. President Trump may come to regret his May 4th executive order easing the Johnson Amendment’s restrictions. This round of political rioting is likely to be more severe on the coasts than in Michigan, but our many college towns should rock out. Soros money and sympathetic urban politicians should recycle arrested Antifa thugs quickly to keep the action going. Obama and Granholm appointed jurists will do their part. And our beloved media will continue to gush with adulation until someone gets killed. You are targeted. Plan accordingly. ← Imagine what these kids could do with a broom and some yard tools? I was able to purchase several items of ANTI-antifa wear at the Old Engine Show in Buckley- American Flag Bandana to be worn around your nose and mouth when dealing with these true Fascist. They advertise on Craig's List for their paid protesters and bus them in. This isn't first Amendment it is treason. It is a continuing decent into the culture of violence in which the left thrives. Unfortunately, it will become necessary to fight the devil on his own turf. I believe that true patriots do not shy away from shedding the blood of tyrants, or their own, when the time becomes necessary. The difference will be that one is done against relentless attackers and the other by a bullying "political correctness" mob. People on the RIGHT are not attackers but the attacked. I can sum it up by saying that political correctness used to manipulate and coerce the opposing group with the connivance of the leftist media, spineless republican politicians and terrorist money(georgie soros), communist and socialist agitators (antifa, BLM THUGS) and the DEMONCRATS, is a form of assault. If I choose to defend myself against this assault using battery then I am fully justified using this form of self-defense. They do not get the luxury of defining the terms! 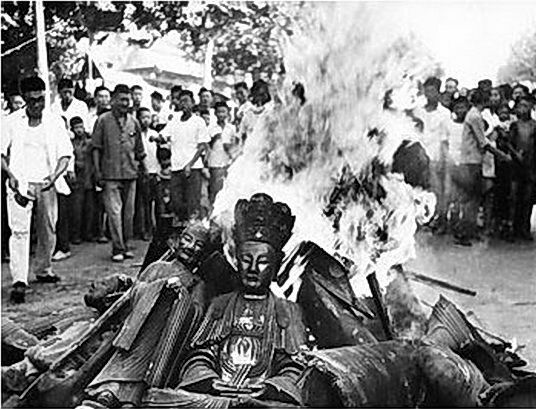 Political correctness is a form of thought control and manipulation perfectly in tune with Mao's "cultural revolution". Let all people who retain an ability to think critically reject them and their definitions. Real patriots love their country and will fight for it. I challenge right wing billionaires to fund groups who will investigate the backgrounds of leftist antifa and blm groups, media types, politicians and obamites, going thru their trash etc. to get to the real dirt. It's there, organize, find it, and bring it to light.